The CL543 model has been discontinued. Please see the CL543B RTD and thermocouple calibrator as a possible alternative or contact our Temperature Engineering department. 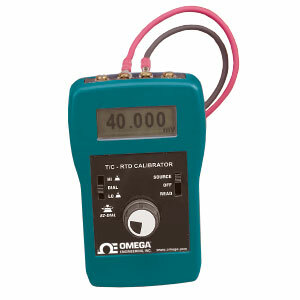 The OMEGA™ CL543 dual T/C and RTD calibrator provides direct temperature calibration to all types of instruments such as transmitters, recorders, controllers, alarms, and data acquisition and computer systems. The CL543 also reads RTD and T/C outputs and displays temperature. It is compatible with pulsed systems and transmitters and has a feature for troubleshooting. The auto detection of 2-, 3-, or 4-wire connections will tell you if you have the wires correctly connected. You can also select “auto stepping,” which offers selectable step sizes and time in-between steps. This calibrator is a superior replacement for decade boxes, eliminating the lugging around of large equipment and the possibility of misreading RTD tables. The CL543 offers the highest performance and the most features in its class by exceeding the accuracy and functions of many higher priced T/C and RTD calibrators. It is a low-cost solution for checkout and calibration of all T/C and RTD instruments in the field, shop, or control room. 참고: The CL543 come with NIST certification, operator’s manual and 9 V battery.